WILD BILLS WILL MAKE YOUR SKI VACATION ENJOYABLE! A ski “package” consists of skis, boots and poles. All of Wild Bill’s skis are newest. 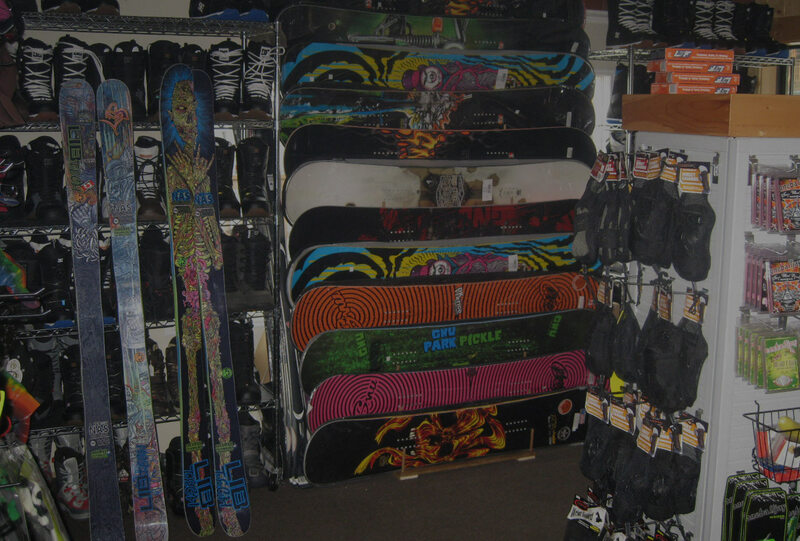 A snowboard package consists of board, boots and bindings. Wild Bill’s offers ala carte rentals of equipment for those that own their own boots, boards or skis. All equipment is inspected and tuned prior to rental no matter which package you choose. Wild Bill’s offers four packages to choose from to fit your level of experience and your budget. From the beginning skier to advanced, Wild Bill’s equipment and customer service will make your ski vacation enjoyable! REMEMBER: Make a reservation 3 days in advance and receive 10% off your entire rental! A Basic Ski package is good ski package for anyone. It comes with rear entry boots and ski poles. A Performance Ski package is a perfect package for most skier types. The package consists of bindings that center you on the ski for better control. A four buckle rental boot aids in a comfortable fit and more control. Poles are included. This is our top of the line package, any skier will benefit from using this equipment. From beginner to expert, this package offers more levels of control with our newest skis and boots. The four buckle boots allow more adjustments so the fit just right and you have great control on the snow! The best equipment equals the best experience. For those future olympians under 12 years old we offer the Junior package with board, boots, and bindings. This package is perfect for those who are mastering the art of snowboarding. For those skiers that simply want the best we offer a demo package.The skies in this package will please the most experienced skier. Come check out our top of the line! Your first stop for fun and ski expertise for your Red River Ski or Snowboard adventure. Bill’s Ski Shop located at the corner of Main Street and Pioneer in beautiful downtown Red River New Mexico.